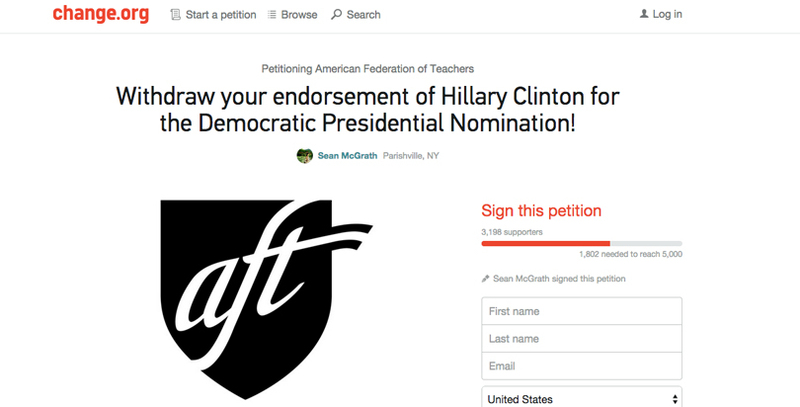 AFT's endorsement of Hillary Clinton sparks online backlash and petition. Some dissent in the ranks? In more practical terms, the endorsement also means votes. A lot of votes. “As in past elections, the AFT's 1.6 million members will be a powerful organizing force behind our endorsed candidate,” the union boasted in its announcement. 1.6 million ballots that Clinton can depend on. In the hours and days following the announcement, a notable wave of backlash swept across the social web in the form of angry tweets, outraged Facebook comments (indeed, it’s rather difficult to find positive comments on the official AFT endorsement post on Facebook) and a Change.org petition that protested the endorsement, citing Clinton’s record of supporting charter schools as well as her support of tying teacher pay to student test scores. 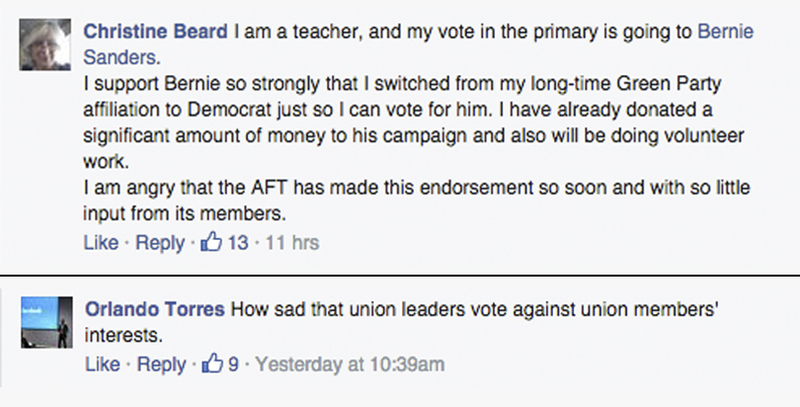 The petition also pointedly adds that other candidates, such as Sanders, are more sympathetic and attuned to teachers’ needs and, therefore, more deserving of the AFT’s praise. 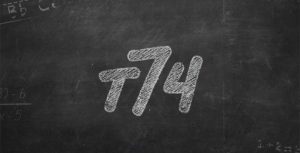 “Bernie Sanders is a product of public education and wants to help teachers teach in a holistic way, not just teach toward a test,” it states. 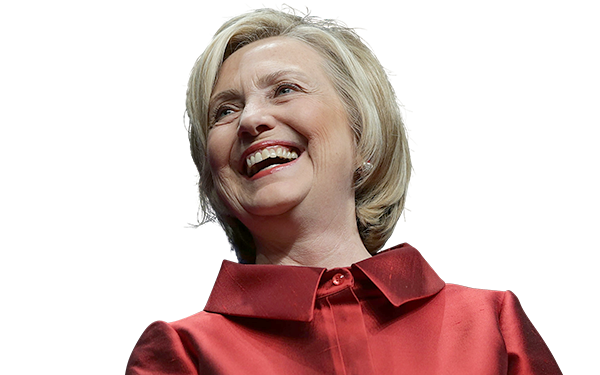 As of press time late morning Monday, the form had secured more than 3,100 supporters.
.@HillaryClinton @rweingarten Hillary needs to say where she stands on testing, evaluating teachers by test scores, charters & Common Core. 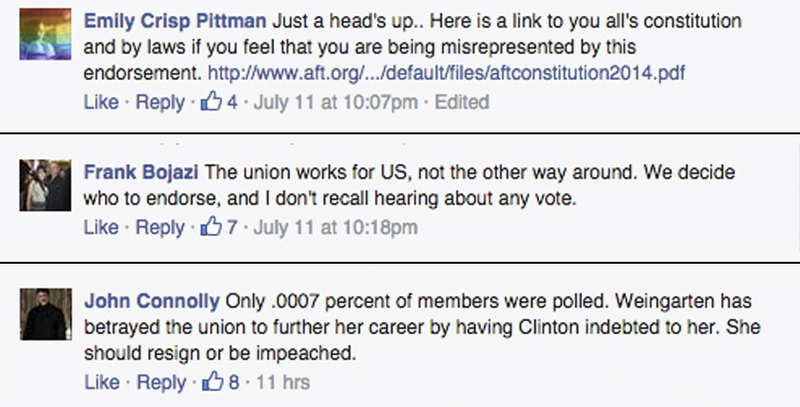 Exactly who did the @aft poll before endorsing Hillary? The Kardashians? @gailDrich @HastingsTeacher @HillaryClinton @rweingarten Don't hold your breath. That obviously wasn't a prerequisite.Another AFT backstab.